In a move to slow, if not halt, the spread of Quagga and Zebra Mussels in California, much of the state has enacted either a complete ban on personal watercraft or instituted an inspection program for all watercraft entering a controlled area. In order to stay informed of any changes, please read the information (from their respective websites) concerning some of the waters in our local area. The information listed here can change at any time, and merely reflects the status as often as it is updated. "Quagga Mussels were discovered in Lake Mead in Nevada on Jan. 6, 2007, and later throughout Lake Mead’s lower basin. It was the first discovery of either of these mussels west of the Continental Divide. Subsequent surveys found smaller numbers of Quagga Mussels in Lakes Mohave and Havasu in the Colorado River, and in the Colorado River Aqueduct System which serves Southern California. Surveys in August found Quagga in Lake Dixon and San Vicente Reservoir in San Diego County. All reservoirs, lakes and watersheds receiving raw Colorado River water have been exposed to Quagga Mussels. 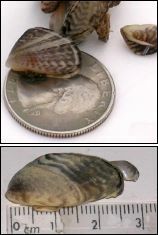 The first confirmed find of Zebra Mussels in California occurred at San Justo Reservoir Jan. 10, 2008." See http://www.dfg.ca.gov/invasives/quaggamussel/ for more up to date information. Beginning May 23, 2008 all watercraft entering four Santa Clara County reservoirs will be subject to a vessel inspection. Santa Clara County Parks wants to educate park visitors on the Quagga and Zebra Mussel threat. These tiny mussels are an invasive species that present a negative environmental impact on California’s reservoirs and waterways. They can breed rapidly and can clog pipes and valves posing a threat to municipal water systems, aquatic food chains in lakes, access for fishing and boating, and recreation-based economics. All other county reservoirs will be closed to watercraft, except by special permit. Inspections at the listed reservoirs began on May 23, 2008. All watercraft, including but not limited to, power boats, personal watercraft, sailboats, kayaks, canoes, and float tubes will be subject to inspection. Please prepare your vessel – powerboats, kayaks, canoes, personal watercraft, etc. - for inspection by having them clean and DRY. Current vessel registration documents are required at the time of inspection. If the vessel is not required to be registered then the vehicle registration will be required. A $7.00 non-refundable inspection fee will be collected per inspection. An annual vessel inspection pass of $35 will also be offered. Passes can be purchased at Parks Administration, 298 Garden Hill Drive, Los Gatos. Boating reservations can be made at www.parkhere.org or by calling (408) 355-2201. A "banding" program will be offered to vessel owners in an effort to reduce additional fees being collected. Once a vessel has left the reservoir for the day, a "tyvek" band may be attached to the vessel between the winch hook of the trailer and the eyebolt of the bow of the vessel. If this band is broken upon reentry into the reservoir, that vessel must be re-inspected before entering the water and an inspection fee will be collected. If any vessels are found to have water in the bilge or live well, or are not clean, they will not be allowed to launch and will be subject to quarantine. If a vessel fails inspection it will be quarantined. Vessel owners will be required to have their vessels decontaminated using hot water treatment. Vessels that have been quarantined must be decontaminated. The mussels and their larvae cannot survive water temperatures in excess of 140 degrees. Click here for Decontamination Procedures. In addition to inspection, vessels coming from all counties south of the Tehachapi Mountains will be denied entry as well as vessels from out of state. The alternative to the minor inconvenience of a boat inspection is having outside boats excluded from the reservoir. Keep a clean, dry boat. Wipe up or drain all water and keep the boat dry. Dry out all equipment such as life jackets, mooring ropes, and anchor lines. Clean and dry the boat hull. Any boat that has areas that can hold water that cannot be inspected will not be allowed on the reservoir. This includes any boats with through-hull fittings, hoses, pumps, live wells, liquid cooled boat engines, and any other area that can harbor water but can’t be inspected. Remove any mud or aquatic plants from the boat, trailer, and vehicle. Wait five days after using the boat in another body of water.